Are You Looking For a Free Toll-Free Number? Looking For a Free Toll-Free Number?
. Published on December 15, 2015. Benefits of MightyCall virtual phone system. How do toll-free numbers enhance accessibility and improve company image? Naturally enough, every business owner is interested in making customers prefer his/her company over competitors. Apart from marketing campaigns, one of the most effective ways to do this is enhancing user experience. In other words, your services should be user-friendly: easily accessible and comfortable-to-use. A potential customer should be free to use his favorite communication method to get in touch with your company. Therefore, increasing your multichannel accessibility and eliminating communication choke points becomes crucial. While a virtual phone number from a reliable provider enables you to access several channels from one place, there’s still room to make things better. If your company operates beyond the boundaries of a single city, your customers have to make long-distance calls to contact you. That’s where things get complicated: instead of making a paid long-distance call, a reasonable person will likely opt for a local business in the same field. However, there is an efficient solution ― a virtual toll-free number by MightyCall. This article answers some common questions about toll-free and vanity numbers. It also explains how to get one and what benefits it will entail. A toll-free number is identified by 8XX prefix, similar to an area code. In the US, available freephone prefixes include 800, 888, 877, 866, 855, and 844. Although the digits are different, all prefixes work identically: instead of charging the caller, an incoming call is paid for by the receiving party. Toll-free numbers are widely used by call-centers of large enterprises, which operate on a national or global scale. However, when telephone companies moved from electro-mechanical to computerized switching systems, 800-numbers became available to small and medium business as well. Still, getting such a number from telecom carrier wasn’t always easy and instant. It required certain negotiations with the provider representatives and took quite a while to accomplish. The next stage of freephone evolution came when digital technology made internet phone services possible. Now a small business owner can subscribe to a virtual phone number, which can be toll-free, vanity or local. “Virtual” means that any associated machinery is located at the provider’s end, while the end-user only pays for the actual service he/she gets. No need to wait ― within a couple of minutes you can activate your own virtual phone number and ― after a quick customization ― have all your business calls forwarded to any device of your choice. But before proceeding to available options, let’s answer a few frequently asked questions. ― Should my business get a toll-free number? While a virtual phone number is standard for modern business communications, toll-free is only necessary if you want to encourage long-distance incoming calls. Therefore, if your company operates on a scale larger than covered by a local area code, a toll-free number can drastically help your clients contact you. This is especially true for online businesses, as they consider the entire nation as their potential customers. On the other hand, even if you actually act on a local scale only, a toll-free number will create exactly the opposite impression. In the eyes of a potential customer, you’ll gain a significant degree of respect due to supposed professionalism ― naturally, that entails a sales boost. ― What is a vanity number? A vanity number is a custom local or toll-free number, which includes a remarkable easy-to-memorize combination of digits or a phoneword. Phonewords (digits represented as letters from a phone keypad) are extremely useful when it comes to instilling a direct connection of your contact data and your business industry in the minds of potential callers. If your business number is something like 1-800-TAXICAB and you do specialize on transportation, your marketing materials can actually show nothing but your contacts. A clever move, right? And it also opens a new avenue for partisan marketing. In fact, a vanity phone number by itself can serve as a valuable asset. An eloquent example is one former Mercedes dealer, who managed to get 1-800-MERCEDES vanity number and shared it with fellow dealers in other cities for a fee. The automaker tried suing the crafty businessman for trademark infringement, but failed. Eventually, it was Mercedes which had to pick another number. ― Have cellphones really rendered toll-free numbers obsolete? While it’s true that freephones are only free for landline callers, you can’t call them obsolete. Yes, landlines are gradually dying out, mobile carriers often offer long-distance calls at no extra charge and requesting for a call-back is almost a standard feature in business communication. However, as factual functionality of a toll-free number dwindles, it is gaining a symbolic meaning. An 800-number has become a hallmark of large corporations who care for customers and have enough resources, experience and professionalism to cater their demands in the best possible fashion. Nowadays it doesn’t take much time and money to get such an option from a virtual phone number provider, but, luckily, an average customer hardly thinks about it when seeing an 800 prefix. Why don’t you take advantage? ― How can I maximize my benefits from a toll-free number? A virtual toll-free number is quite useful as it is, however, if combined with an advanced call-processing system, it turns into the most efficient communication instrument in existence. 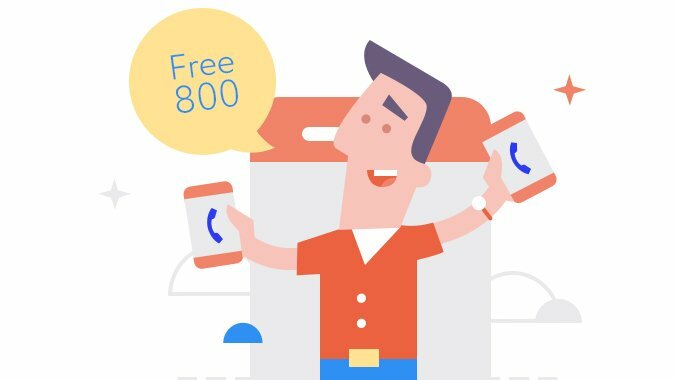 As the number of your incoming calls increases, you’ll want a handy tool to process them (missing calls isn’t exactly good for business) ― a virtual phone system. Multiple extensions make it possible for team members to stay connected to the system all the time: the software will route incoming calls and ring all their phones simultaneously, in sequence or in any pre-defined order. Should a customer call after hours, you can still receive his message via voicemail. Such features as voice menus, music/messages on hold and call queues enhance caller retention, thus effectively reducing the number of premature hang-ups. Actually, there are just too many features to describe and all of them are very flexible, so that any business owner will find a configuration to his/her liking. ― Does an 800-number tie me to landlines? As a rule, virtual phone number providers offer call-processing solutions compatible with any communication device. Therefore, you’re able to utilize all existing infrastructure with 100% efficiency (no additional equipment needed). Forwarding to mobile phones is especially handy for urgent calls and if you spend a lot of time out of the office. ― Will I lose my number if I decide to switch to another provider? No. Toll-free numbers belong to you, not a carrier. When you buy a toll-free number, it’s yours to keep. Many virtual phone number providers offer such features as porting: they will seamlessly connect the existing number to their system, so you won’t need to alter your marketing materials to show new business contacts. Why use MightyCall as your toll-free number provider? Expertise and care. MightyCall has been helping small and medium business owners for years. We’re proud of our experience in dealing with communication issues a company may face and we’re always ready to share our insights for your benefit. Our customer support service is one of the best in the industry, while an extensive knowledge base (FAQs, tutorials, video instructions) provides a good opportunity to enhance your communications model. Exclusive mobile application. It’s not always convenient to open your browser in order to access a call-processing system’s features. That is why we’ve developed a mobile app, which allows you to change the system configuration on-the-fly. What’s more, the application is designed with functionality in mind ― the features include instant call redirection, analytics tools, tools for delegating tasks to team members, to-do lists, social media integration and much more. All in all, MightyCall Mobile turns your smartphone into a portable yet mighty communications center. No extra equipment. All servers, databases and associated infrastructure is located at the provider’s end. It means that you won’t need to purchase and maintain any hardware you don’t currently use. This cloud-based model also lets us charge considerably less in comparison with conventional telecom providers. Bring-your-own-device compatibility. MightyCall will route inbound calls through any available infrastructure (landline, VoIP, cell network), so that you can stay connected to your virtual phone number regardless of your current location. Making outbound calls is also possible and the caller ID will show your business number. Flexibility. MightyCall is a software-based system, so subscribers are free to alter the configuration any time they want: change routing rules, add phones and extension, adjust the voice menu, etc. We pay close attention to usability, that’s why all the essential options are designed as easy step-by-step flow-charts ― it doesn’t take an expert to setup and configure MightyCall. Scalability. We don’t insist on signing long-term contracts, so you can start with the least-expensive rating plan and activate additional features as your business grows and communication needs increase. With no equipment installation needed, MightyCall cloud-based solution is a good option for those unsure of their demands. MightyCall assures that you won’t be bound by contract is you don’t need our service anymore and, on the other hand, it will be perfectly easy for you to add more power to your setup if you need it. Efficient teamwork. Doing business is all about teamwork, and flawless communication is one of its crucial aspects. MightyCall provides the perfect opportunity to keep your team connected via landlines, cellphones or IP telephony even if the employees work remotely. Conference calls, real-time assignment of customer requests, unlimited customizable extensions, explicit communication statistics and many other features are at your fingertips. MightyCall virtual phone system helps you build a perfect team, working as a single entity to benefit the common cause. Reliability and security. With decades of efficient operation in the field of business communication, MightyCall knows perfectly well how to avoid potential problems before they occur. We use quality hardware only, and our skilled maintenance team constantly monitors its condition. In terms of software, we update our server applications regularly and provide our users with automatic client updates. Thus, we can guarantee server uptime, so you won’t find yourself disconnected during an important call. We treat all personal data as confidential and take redundant security measures to protect privacy of our subscribers. Credibility is the key to generating sales and attracting new customers. Building credibility may be quite problematic in highly-competitive fields or if you own an online business. One way to be credible is to be easily accessible, which means using social media, having a company website, email address, online chat and a toll-free phone number. While keeping track of all these channels may be rather hard, there’s a quick way to make things much easier: MightyCall cloud-based phone system lets you become a master of multichannel communication within a couple of minutes.